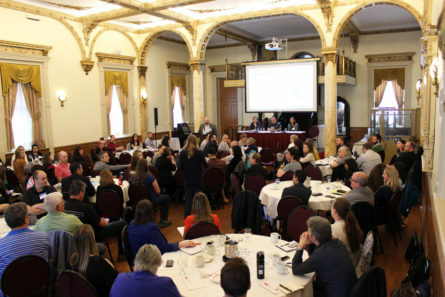 Last week, leading sustainability professionals, scholars and administrators from across the country gathered at McGill and Vanier College for the first-ever Canadian Sustainability in Higher Education Conference. In an era of four-year election cycles and even shorter news cycles, higher education remains one of the few relatively constant institutions in our society, which is significant because the production and dissemination of knowledge is essential to confront the monumental challenges facing the people and the planet, like climate change. The Faculty Club hosted part of recent Sustainability in Higher Education Conference. This is one of many topics discussed at the event, which was co-organized by the Canadian College and University Environmental Network (CCUEN), an organization which represents environmental educators at colleges and universities, and the Canadian Alliance of College and University Sustainability Professionals (CUSP), which represents sustainability professionals on Canadian campuses. Until now, these two groups had not gathered for a joint conference. In keeping with the central theme of the conference, the campus as a living lab, what was often reiterated was the importance of working with students in the sustainability transition. While this may seem obvious for higher education institutions, it is an element that is often overlooked due to the seemingly diverging priorities of academic and operational units on campus. Indeed, as many panelists shared, students can examine and offer solutions to sustainability challenges on an off campus through applied student research. In the process, they receive invaluable hands-on learning experiences by working with different stakeholders throughout the university (or the world) who are experts in their respective fields. 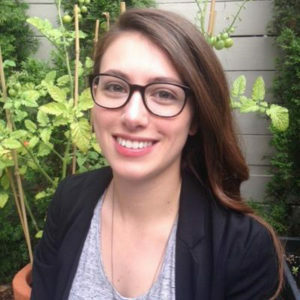 McGill Professor Catherine Potvin, speaking on a panel with two other UNESCO Chairs, mentioned a student that participated in her Panama Field Study Semester whose GIS research became a building block for new sustainable urban plans in Panama City. “Students offer amazing brain power,” remarked Potvin. Indeed, for several years, student research at McGill has fueled many sustainability milestones on our campus—from Marine Stewardship Council-certified seafood being served in our cafeterias, to real-time monitoring of our energy usage in university buildings. Professor Potvin spoke candidly about her research on climate change and her experience working with an increasingly disillusioned body of students who sometimes feel hopeless in in the face of these massive challenges. “Our role is to give students hope; without hope, there can be no action,” said Potvin. As sites of growth and discovery for the next generation of leaders, promoting sustainability in higher education – and sometimes providing the hope needed to fight the good fight—becomes an integral part of the university experience.